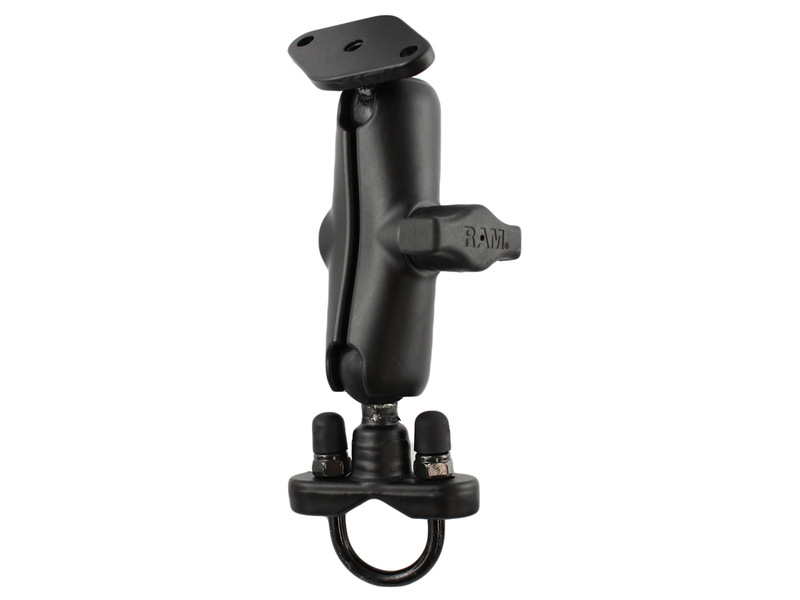 RAM Mount makes great mounts which carry a manufacturer lifetime warranty. They make a lot of mounts. We mean a LOT of mounts. Sometimes the selection can be daunting and we thought a blog posting on the various handlebar models would help to highlight the different types and purposes. Their products range from simple handlebar mounts for bicycles to metal mounts for motorcycles and ATVs. Let’s take a closer look at RAM mounts for handlebars. First up are RAM mounts for handlebars on bicycles. The RAM Rail Mount Base is a simple plastic mount that fits bars up to an inch. It will fit RAM’s cradles that use the two hole diamond adapter on the back. To attach to your handlebar, simply remove the screw and nut on the bottom, slip over your handlebar and reattach the screw and nut. You will need a screwdriver to install these and these are not meant to be installed and removed with each use. We do not recommend this one for motorcycles. This is RAM Part RAP-274U. RAM part number RAP-274-1U also fits the holders with diamond adapter. These use included 7″ long cable ties to attach to your handlebar. The cable ties are industry standard and you can replace them with the same ones that you can buy in any hardware store. Be aware, these mounts are meant for permanent installation. Removal means cutting the ties. While easy to replace, to me it’s a pain. While I know of some motorcycle use, these are also not recommended for motorcycles. My opinion is that you need something sturdier than plastic ties in a high vibration environment. There are many different RAM mounts for handlebars on motorcycles. We find most motorcycle handlebars fall into the 1-1.25″ diameter range and the mounts that we will discuss all fit this range of diameters. In the photo that accompanies this article is the RAM Metal U-Bolt Mount. Variable arm sizes are available in 1.75, 3 and 6 inch arm lengths. The one in the photo has a standard three-inch length. You will need a wrench or pliers to install this mount. The mount is made of metal and comes with a lifetime warranty. It fits handlebars up to 1.25 inches diameter. A common accompaniment for these is the RAM X-Grip cradle. A new entry from RAM is their Tough Claw Base. This is a heavy-duty spring-loaded clamp that fits your handlebar. There are a variety of these available with a wide array of diameter openings and ball sizes. You will need to add the arm and other parts to make this base fully functional. The mount is easy to install and remove. Lastly, RAM makes a handy economical model called the Ram Mount EZ-Strap Mount with Short Arm and Diamond Adapter Base. This one is constructed of plastic and will use a strap to attach to your handlebar. It fits handlebars to 2.58 inches. The mount is easy to install and remove. Simply push the lever and pull on the strap. We would not recommend this mount for rough use such as off-road on at ATV or in extremely cold weather. This is the least expensive of the RAM mounts that are suitable for motorcycle use. This is RAM part RAP-SB-187U. All of these RAM mounts for handlebars on a motorcycle have a diamond adapter to fit RAM cradles. Some can also be fitted with square or round adapters for other cradles or special situations.